Algerians, like many former French colonies, are used to watching some of their most promising potential internationals playing for the old rulers. Algerian fans will probably cheer Karim Benzema due to the French-born striker's Algerian heritage. They might also rue, or maybe sardonically snicker at, Samir Nasri — another Frenchie with Algerian parents — for being left back in France this go-round. No headache would hurt enough to not dress a talent like that in our colors, they might think. There is a long tradition of those with Algerian heritage representing France, stretching back from Abdelkader Ben Bouali, continuing on with all-time great Zinedine Zidane, and now seen with Benzema and Nasri. 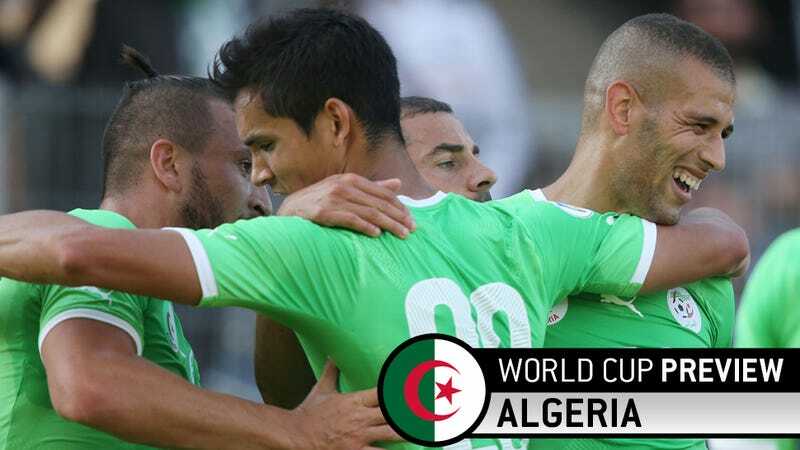 Today, Algeria are either gifted or cursed with the other side of that coin: While the best Algerians opt for France, the lesser Frenchmen with Algerian ties ply their international trade with Algeria. Only seven of the 23 in Algeria's World Cup squad were born in Algeria; the rest, in France. What this adds up to isn't anything special. Algeria are on the short list for the title of Worst Team in the Field. FIFA has them ranked 22nd, which is generous to put it mildly. The Elo Ratings puts them at 31, just above Cameroon, which is also generous — Cameroon may be old, but they still have a handful of players that scare you; Algeria have maybe two. And although Algeria have very little World Cup experience — while only competing as a sovereign nation since the 1966 Cup, this will be just their fourth trip to the finals, and will probably end like all the others, with a group stage exit — they were involved in one of the most ignominious matches in World Cup history. That all took place back in 1982. Algeria were in Spain, making their first appearance in a World Cup. In the opening game, they shocked West Germany in a 2-1 defeat. They went on to lose to group mates Austria before beating Chile in their last group match. However, the group as a whole still had one more match to play, between Austria and West Germany. Going into the game, Austria and Algeria were level on points, with Austria topping the group because of goal difference, and the Germans in third with two points. (Back then, a win was only worth two points.) Any win by West Germany meant they would top the group on goal difference, but Austria's fate would be determined by just how much the Germans won by. If it was a one or two goal win, they were safe. But a three goal win, and Algeria would continue into the tourney's next phase. The game ended West Germany 1, Austria 0, but the score is not how the match is remembered. In German it is sometimes called Schande von Gijón (The Disgrace of Gijón), other times Nichtangriffspakt von Gijón (The Non-aggression Pact of Gijón). Those names tell the story. After a German goal ten minutes in, the two teams were more interested in passing the ball around in the midfield than trying to score. What's happening here is disgraceful and has nothing to do with football. You can say what you want, but not every end justifies the means. But with the result in hand, the two teams continued on. Austria didn't make it out of the second group stage. West Germany made it to their second consecutive final, but lost to Italy. In light of that final match of the opening group stage, FIFA changed the rules to the current format, where the last group games are played simultaneously. It was scant consolation for the Algerians, though. The Desert Foxes earned their way back to the World Cup in 1986, though their single point in the group stage meant Algeria would not benefit from the new rule they helped inspire. They didn't make it to the World Cup again until 2010, when they had a chance of their own to break a nation's heart on the final day. We all know how that ended. It was a fight for Algeria to get to Brazil, but one they eventually won. In the first match of their two leg playoff way to Burkina Faso, Algeria fell 3-2. But back home, they managed a 1-0 victory to win out on away goals. Drama seems to follow these guys. This is the only stat you need to know about Spanish club Granada's speedy winger: He lead La Liga in successful dribbles per game. In a league with Gareth Bale, Cristiano Ronaldo, Neymar, and Lionel "The GOAT" Messi, Brahimi broke more ankles than all the rest. I mean, watch for yourself. He's an absolute beast. The rest of his game is fairly unremarkable, and for country he is often played in a more central role rather than his preferred spot on the flanks, but when he is on the pitch, he's maybe the only Algerian player capable of producing fireworks. Feghouli is Algeria's main man. He's a similar player to Atlético Madrid's Arda Turan, in that he plays in a wide right position but often cuts inside not to shoot, but to create chances for others. Feghouli isn't a nifty dribbler like Brahimi, nor is he a natural goal-scoring wide man, but his creativity and incisive passing will most likely be the avenue of whatever goals Algeria do muster. Might as well say it: This is the worst team in the World Cup. They are a scrappy bunch who look to impose themselves physically on a game, but still; they aren't very good. Oh, and when Algeria are outmatched either physically or technically — both of which will usually be the case in Brazil? They foul. A lot. And with refereeing typically running tighter at World Cups, expect Algeria to finish at least one game short handed. The Desert Foxes' biggest problem isn't that they often resort to kicking people, though. (Italy have done that for years with more than a little success.) It's the utter lack of team shape in attack and defense that promises to kill off any hopes of an Algerian Cinderella run. The spine of this team is decidedly brittle. That's because of deep-lying midfielders Mehdi Mostefa's and Medhi Lacen's reluctance to track back. This limits Algeria's best attacking spark, Sofiane Feghouli, forcing the Valencia wide man to do the kind of defensive work that, you know, defensive midfielders are supposed to do. And whereas the old Dutch approach of only defending with defenders while the other six or so of them picked apart any defense in the world could compensate for this type of defensive disinterest, Algeria's defenders are known for their love of the reckless slide tackle. The most egregious offender is right back Nacer Khoualed. A video of his tackles should be shown to all grade-school children as an example of what not to do. Even going forward, Algeria don't look much more coherent. For vast portions of qualifying play, it appeared as though Les Fennecs had no attacking system to speak of. Lopsided play and head-down dribbling left Yacine Brahimi isolated up top. The striker didn't work hard enough off the ball to get much of it anyway, still, what little service he did receive often came in the form of individual plays by teammates. As such, we very nearly didn't include a formation diagram in this scouting report. Instead, we have to include two. There will be an inclination among commentators desperate to say something — anything — nice, that Algeria play a free-flowing brand of soccer. It's not entirely inaccurate. There are talented attacking players in this squad. But their inability to consistently play a cohesive system makes all that free-flowing soccer look more like a waterfall than a raging, directed river. Basically, any team that's too tactically naive for Burkina Faso will far fall short of advancing at the World Cup. Algeria will be lucky to get a point.